Alex Theoharides (@Minne_Pop, @TWolvesDaily) look at the messy situation in Mo Town. Let’s begin with a cliché: The Detroit Pistons are running onempty. They have lost 8 of their last 10 games and are rapidly fading out of the 2014 Eastern Conference playoff race. Part of the Pistons free fall, of course, has to do with tanking. In order for the Pistons to make a selection in the 2014 draft, they need their pick to fall in the top 8. Otherwise, it gets sent to the Charlotte Bobcats. However, the Pistons are not a team that was built with tanking in mind. In the offseason, owner Tom Gores proclaimed, “We better make the playoffs,” and he empowered Team President Joe Dumars to spend millions of dollars on players who make no sense playing next to each other. The Pistons roster is built as if Dumars was picking teams for a pickup game and had nothing to go with other than a vague sense of who looked most like a baller. The roster includes 6 power forwards: Josh Smith, Greg Monroe, Jonas Jerebko, Charlie Villeneuva (who, thankfully, finally comes off the books next season), Josh Harrellson, and Tony Mitchell. Pistons point guard Brandon Jennings is more famous for A) choosing to play in Europe over a year of college basketball, B) for not showing up to draft night until he was selected 10th by the Bucks, and C) for posing after MISSED three point shots than he is for any successes as an NBA player. The Pistons most valuable player, center Andre Drummond, has spent most of the season embroiled in an online romance/feud with iCarly starlet Jennette McCurdy. And worst of all there are rumors that former star Isiah Thomas might become the team’s next president. The argument for hiring Thomas is that he would galvanize the fan base. Detroit is not a basketball city. Even with the team’s success in the 2000s and the long line of basketball royalty that hails from the city—Magic Johnson, George Gervin, Steve Smith, Chris Webber, Jalen Rose, etc.—the Lions, Tigers, and Redwings (oh my!) are still more popular locally. In order to attract fans, the Pistons need to make a splash. And hiring Isiah would do that, despite his utter failure as a coach and GM of the New York Knicks. However, the popular sentiment among smart basketball fans in Detroit is that the team would be best served moving away from the model of hiring former stars to make basketball decisions. Instead, there is a push for the Pistons to hire a no-name general manager, who will build the team around young players like Drummond and Monroe rather than expensive veterans like Josh Smith and Charlie Villanueva. 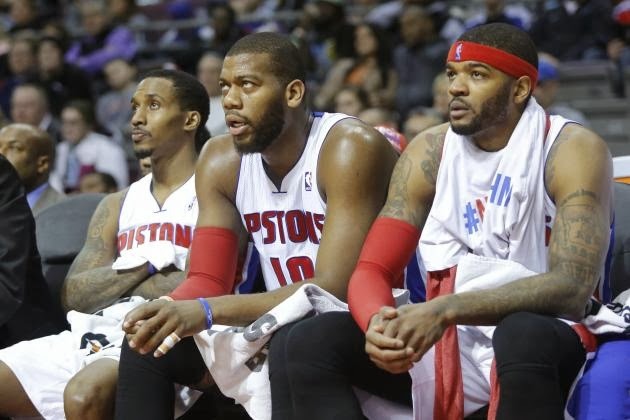 Either way, the once proud Pistons are poised to become a bottom feeder in the Eastern Conference for years to come. The Indiana Pacers have looked sluggish on offense lately. While they still remain the biggest challenge to the Heat in the Eastern Conference, I would no longer consider them a clear favorite if matched up with the Thunders, Spurs, or even Clippers in the NBA finals. Gerald Green HAS to be the most improved player this season. While Goran Dragic is the beating heart of the Phoenix Suns surprising run, Gerald Green is their assassin on offense. His dunks get all the attention, but if you really want to see his athleticism watch how high he gets up on his jumpers. Coach of the Year is the most dangerous award in the NBA. Often, as in the case of George Karl, it leads to the recipient being fired. With that being said, I would give Rick Carlisle of Dallas the slight nod over the Suns Jeff Hornacek. While the Suns’ season has been remarkable, Dallas’ success has been even more impressive. The one team no one wants to play in the Western Conference Playoffs? The Memphis Grizzlies, who yet again are the team most likely to throw a wrench in the plans of the prohibitive favorites in OKC, San Antonio, Houston and LA. Player of the Week: Gerald Green, whose career high 41 points on Thursday night led the Suns past the Thunder. Worst Performance of the Week: Kevin Martin, who combined his typically atrocious defense with a barrage of missed shots in a bad loss to the Knicks on Wednesday night. There is growing sentiment among Wolves’ fans that the team was playing better while Martin was out with an injured thumb.